Compact, yet powerful, the Saber Blade 16 is the right scrubber for small to medium-sized jobs. Adjustable cleaning pressure and multiple brush options are available for flexibility to clean any type of hard floor. The large clean and dirty water tanks allow for longer run times to maximize productivity. 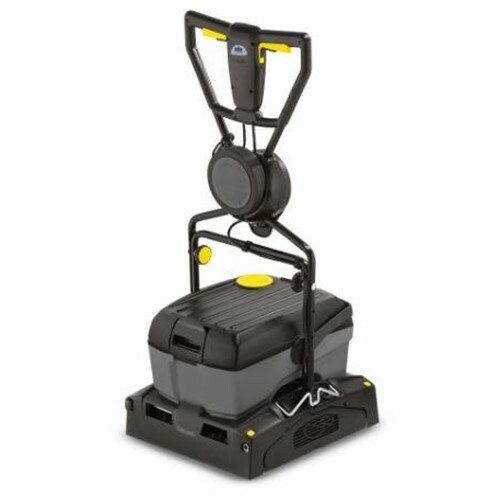 Compact design provides powerful scrubbing in congested areas. Two counter-rotating brushes with variable cleaning pressure, up to 88 pounds. Two squeegees for pick-up in forward or reverse. Large 2.5-gallon tanks for longer run time. Solution and recovery tanks are easy to fill, empty and clean. Easy to understand control system with ergonomic handle. No tool brush and squeegee removal for easy maintenance. Down pressure adjustment for effective cleaning on different floor types. Variety of brushes available for any cleaning application.